Our Future Rooted in Our Past: Free Marriage Record Database? 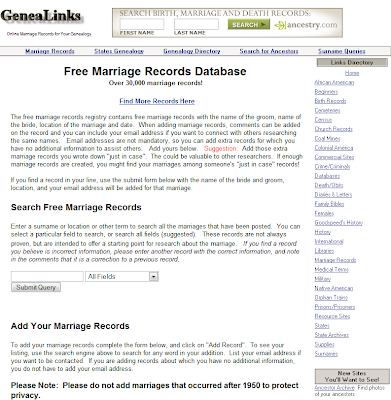 The Genealinks website has a user contributed Marriage Registry Database that can be researched for free, utilizing the easy to use search engine. You can research the database by the groom or bride,location and/or date. One nice feature of the site that I liked is that you can type in the state that you think the marriage occurred and browse through the entries that are currently in the database for that state or country. Another nice feature of this site is that the contributors have the options for comments regarding the marriage and to put the contributor's email address with their entries which allow you to contact the contributor for further information and clarification. The database contains over 30,000 entries and is continuing to grow as people contribute their information. The site also provides a form that can be filled out if you want to contribute; remember however that they do not want marriages after 1950 due to privacy reasons. If you would like to research or browse this free database, please click Free Marriage Regisitry. Have fun!